Here's a quick little review of another variety of Starburst I picked up recently. This one carries a summer theme, with four different fruity flavours that apparently resonate with the season. We have lemon lime, cherry cooler, strawberry watermelon and grape slushie. An interesting sounding range of flavours, though in practice they're not all that. The lemon lime has a citrus hint, but is lacking in any real tartness, the strawberry watermelon is more strawberry and less watermelon. As for the cherry and grape, they have those overly artificial fruit flavours which leaves the cherry tasting a bit like a bakewell tart, and the grape not tasting like real grapes at all. So they're not really authentic fruit flavours, and I wouldn't say they conjure up images of the season in my mind. 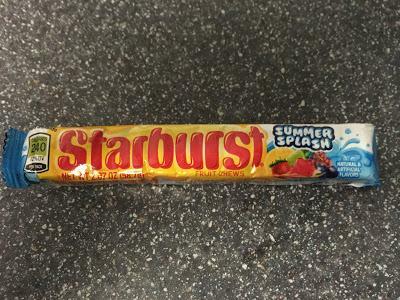 Overly sweet Starburst that are lacking in authentic flavor.